Enjoy this quick and powerful counted Ashtanga practice that will get you breathing deeply and moving with intention. 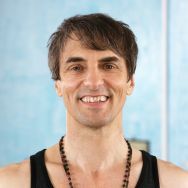 David Garrigues is an internationally recognized yoga teacher and creator of the Asana Kitchen video instruction series that is one of leading online yoga learning resources. David is the founder of Ashtanga Yoga School (AYS) of Philadelphia and also travels extensively throughout the US, Europe, and India offering workshops, in-depth studies and retreats. David also writes passionately and eloquently on the subject of yoga. He is the author of several books on yoga that offer expert technical instruction and poetic inspiration. For more than 20 years David has maintained an enthusiastic personal practice that is dedicated to asana and pranayama study in the Ashtanga tradition. His intense dedication to practice and to teaching inspire his students who form a diverse soulful, open hearted, and serious global learning community.